Offer birds a charming, covered dining spot by placing this Woodlink Rustic Farmhouse Ranch Seed and Suet Bird Feeder in your yard. 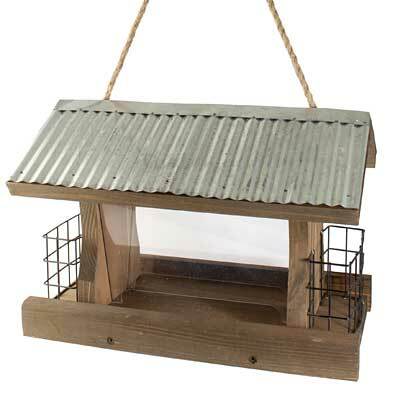 A combination of wood, metal, and plastic create this traditional feeder, and perfectly capture the rustic motif. Deep brown, stained wood lends an aged look to this item while forming its classic frame, and two plastic panels create the feeder reservoir. This center section accommodates 2 quarts of sunflower or mixed seed, and a pitched roof protects it from the elements. Corrugated metal flashing covers the roof, and its significant overhang directs water away from the suet cages flanking the reservoir. Each of these open, metal grids holds a standard suet or seed cake, and their square mesh and brown tone perfectly enhance the feeder. Use the attached, rope hanger to place this unit on a bracket or hook within your yard. The roof easily lifts upward for cleaning and refilling, and the thick wood construction forms a hardy piece. Bring a bit of farmhouse style to your bird garden with this Rustic Farmhouse Ranch Seed and Suet Bird Feeder.